Republican U.S. Senate Candidate Tom Smith chats with East Marlborough’s Roger Howard as Chester County Sheriff Carolyn “Bunny” Welsh looks on just before a campaign event, Sunday, to boost voter enthusiasm. WEST CHESTER — Local Democrats and Republicans gathered this weekend at separate events designed to boost enthusiasm ahead of Tuesday’s elections — headlined by the race for president between Barack Obama and Mitt Romney — but shared one message: the election will be close and every vote is needed. 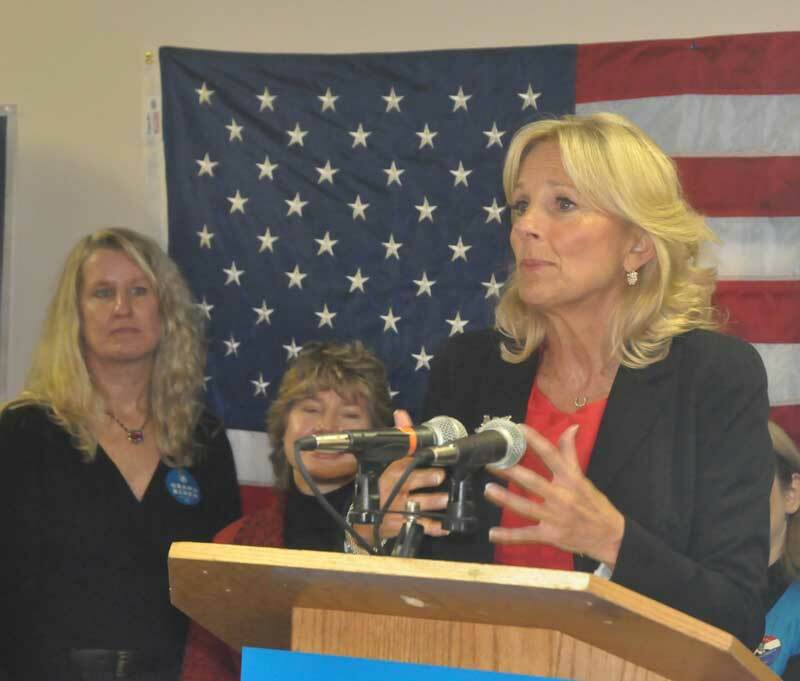 Dr. Jill Biden, wife of Vice President Joe Biden, visited the Obama for America office on Gay Street, Saturday morning and addressed a packed crowd of more than 100 supporters, crammed into virtually every lack nook and cranny available in the strip mall store front. 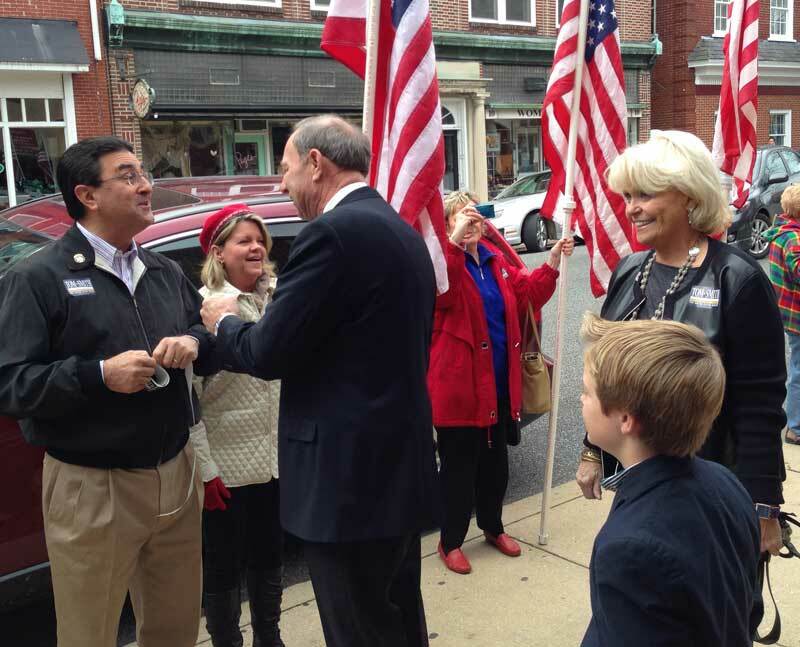 On Sunday morning, U.S. Senate candidate Tom Smith addressed a boisterous crowd of some 40 Republican supporters in front of the Chester County Republican Committee’s office on Church Street. Although the specifics of their message were different, local Democrats and Republicans both said they knew how close races in Chester County from president on down on the ballot were likely to be and that supporters needed to keep working the phones and knocking on doors right up until election day to get their candidates elected. 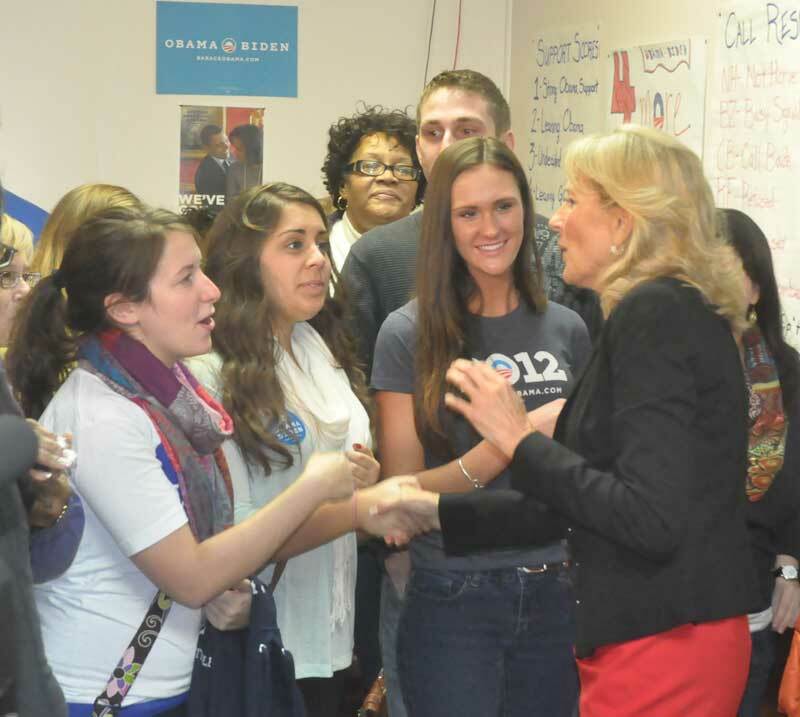 Jill Biden, wife of Vice President Joe Biden greets supporters of Barack Obama at the campaign’s West Chester field office, Saturday. Biden, a frequent visitor to Chester County — her home in Greenville, Del. is just minutes away from the county, and one of her two masters degrees was earned at West Chester University — offered thanks to the workers in the West Chester Obama field office, and stressed how important their work on behalf of Barack Obama and Democrats has been. She spoke about the importance of continuing to “move forward” — and not revert to the policies of the George W. Bush Administration, which she suggested Gov. Mitt Romney would embrace and push the country back into financial turmoil, all while cutting taxes for the wealthy, and slashing public programs such as Medicaid and Medicare and education funding. 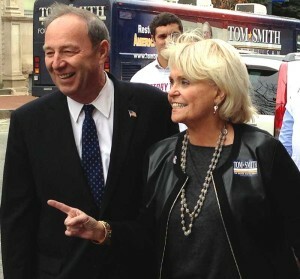 Republican U.S. Senate Candidate Tom Smith greet local Republican supporters accompanied by Chester County Sheriff Carolyn “Bunny” Welsh in West Chester, Sunday. Republicans, meanwhile, braved a cold, blustery morning outside, to greet Smith and boost enthusiasm for the GOP ticket. The number of attendees may have been limited by last-minute changes to the schedule, prompted by the decision of the Romney campaign to add a stop in Bucks County, Sunday. Sheriff Carolyn “Bunny” Welsh introduced Smith, who is attempting to unseat U.S. Senator Bob Casey Jr.
Smith spoke to the crowd and thanked them for the warm support he’s seen while running for U.S. Senate. It is the passion of supporters like those in Chester County, Smith said, that the race has tightened so dramatically. “The biggest reason is because of you,” Smith said. I know that to be true, I know how hard you’ve been working on this campaign and for the future of our children. It is I, who need to thank you and I do. I wholeheartedly just thank you for everything you’ve done. Also on hand were Chester County Commissioner Terrence Ferrell, State Representative Dan Truitt and former County Commissioner Colin Hanna, showing their support for the Republican slate. Jill Biden makes a passionate point in front of a packed crowd at Obama headquarters in West Chester, Saturday. In addition to Biden at the Democratic event Saturday, Philadelphia Mayor Michael Nutter spoke to the crowd. Nutter derided as cynical and pointless, a late move by Republicans to attempt to contest Pennsylvania. Chester County Commissioner Kathi Cozzone, West Chester Mayor Carolyn Comitta and Democratic County Committee chair Michele Vaughn were also on hand to offer their support for the Democratic ticket. There is debt and then there is debt. President Bush and co. put a couple of wars on a credit card and cut taxes. Debt to save the Country from fiscal collapse was imperative. Gas prices are related to world-wide demand. The president cannot control that. Domestic production is at an all-time high. What new ideas did Mr. R. offer you? Any details on that? Dr. Jill Biden’s comments about fiscal responsibility are laughable. Her husband and President Obama have added over 6 trillion dollars in debt over the last 4 years. How much more debt will they put on the US credit card if they are given another 4 years. Also, instead of bi-partisanship, we have had the most divisive president in history. Gas prices have doubled, our homes are worth less than they were 4 years ago, and everything else continues to cost more. Fiscally, the president supports a policy of just printing money to spend on his agenda. No wonder the dollar has lost half its value over his term. I have friends who are democrats and republicans. This president has no new ideas, and hope and change has become lies and deceit. When will we hear the truth about Libya? And not the b.s. story about an internet video. We need change tomorrow, and the change that is needed is a new president. I hope everyone comes out to vote.